Atlantic Theatre School Master teachers Anya Saffir and Jacquelyn Landgraf land in Melbourne Australia at Brave Studios. We are now in Day 2 of this exciting 5 day intensive in Practical Aesthetics. Practical aesthetics is an acting technique originally conceived by David Mamet and William H. Macy, based on the teachings of Stanislavsky, Sanford Meisner. 1) The “Literal”: The essential and most basic description of what is taking place. 2) The “Want”: What does one character ultimately want the other character to say or do. 3) The “Essential Action”: An evocative and relevant description of what the actor wants within the scene. It is essential to understand that what the character is doing and what the actor is doing are separate. 4) The “As If”: This relates the “essential action” to the actor’s own life. This technique is aimed at making the experience of acting entirely based on the will of the actor. It is in response to “The Method, “ which some believe uses more introverted and self-based practices. The Practical Aesthetic asks an actor only to commit his will to the pursuit of an action based on the other actor. 14 talented actors have the wonderful and rare opportunity to work the technique in Melbourne Australia at Brave Studios. Actors will be guided through a compressed process of the work to enhance their work and impulsively get closer to their truth. Many Australian actors audition for the Atlantic Theatre School in NYC to experience training in Practical Aesthetics. 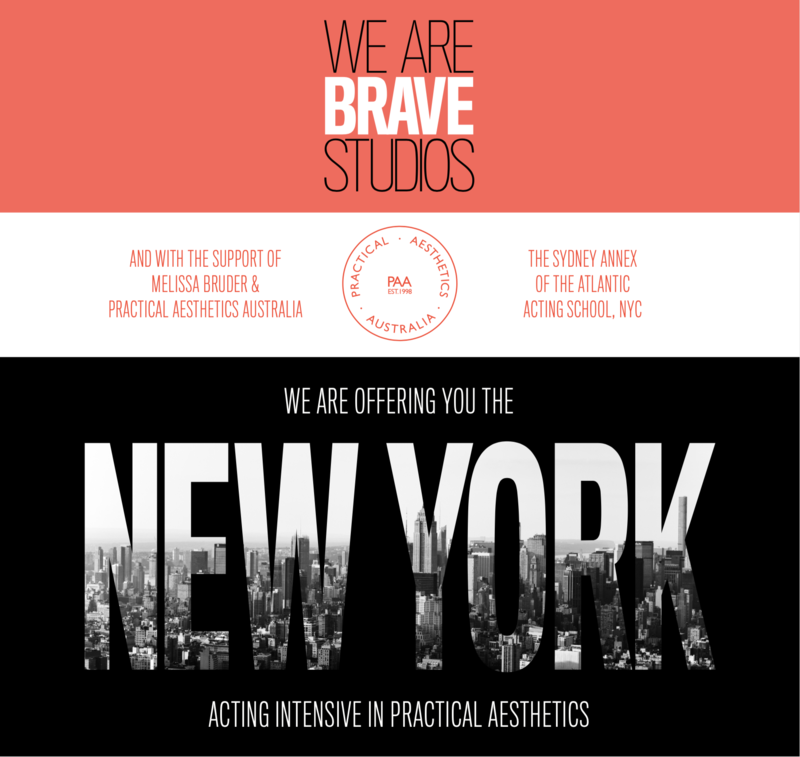 Brave Studios are honoured to have Anya and Jacquelyn in Melbourne to teach Practical Aesthetics to actors in Australia. The teachings so far have been insightful, practical and inspiring. We look forward to the next 3 days ahead. For those of you new to Practical Aesthetics taught at the Atlantic Theatre School you can audit the last 2 days by clicking here. Don’t miss out!